What inspired you to give cycling a go? Primarily to get some regular exercise but the Brompton also allows quicker travel around campus, which is very useful in my job role. A side benefit, which slightly negates the first, is that I can get to and from the Thursday lunchtime pint quicker! 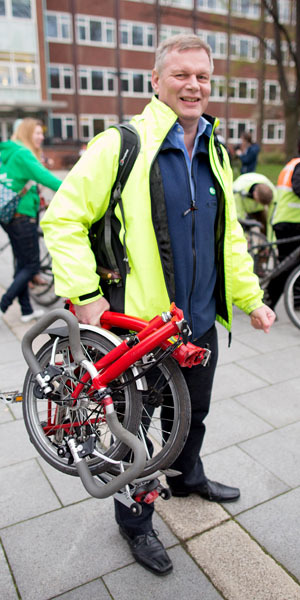 What do you enjoy about cycling to work? Passing the stationary traffic in Warrington! Also it is very pleasant cycling in the summer, and always great to burn off a few calories, particularly post-Christmas! What would you say to other people thinking of giving cycling a go? Do it. The benefits are clear; increased fitness, cost saving over public transport, and the fact that it is better for the environment are just some of them. In addition there is already a strong community of cyclists within the University and regular events related to cycling.